Fantastic set of Haikus, Jenn..
A great collection! Love the enigma that “dreams cloud the issues at hand”. Those are wonderful, Jenn. I’m definately moving to a new beat and I’m going to put it like that, a perfect descrption, thank you. I really like the gentle energy in the third one. Those who are unsure are on the Transition Road for sure! OTOH, blue eyes are gray in the dark..
Uggh, you seem to be picking these blog topics like pouring salt on me! Wow Haiku that hit home! Sorry I am so late I posted early this more but forgot to come here. Hope you’re feeling better! transitions give us the chance to re-think our steps and our options. maybe they’re signs for us to change course. 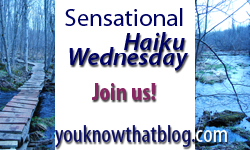 i love all your haiku pieces for this week’s theme, jenn. i enjoyed reading the entries this week. they are all uplifting and positive. I really like that last one! I think I’m snowed in.